Mon.-Thu. 11 a.m.-8 p.m.; Fri.-Sat. 11 a.m.-9 p.m.
From hole-in-the-wall to haute cuisine, restaurants inhabit a broad spectrum of formality, but almost all of them cultivate an atmosphere. And while decor goes a long way toward communicating an establishment's ambitions, ultimately it's the interactions with the staff that set the tone. Most strive to be friendly and welcoming, but only rarely does an experience that starts with food end up feeling like it's about new friends. 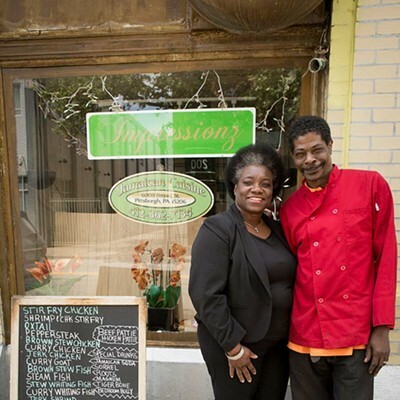 Impressionz is the fourth consecutive Jamaican place, dating back at least to the mid-'90s, in its storefront on Broad Street in East Liberty. It is small and bright, with island-themed murals airbrushed on the walls, tables for two lining the side opposite the counter, and a raised platform at the back that creates a sort of beach pavilion for one large table. Most importantly, Impressionz is a family restaurant that made us feel like part of the family. Chef Desmond Knight doesn't stay hidden in the kitchen but brings finished dishes to the table — and he'll stay to talk about them, too (though he won't give up his secrets). Middle-schooler Cecil fetches drinks between pages of homework, his younger sisters stand ready to befriend any child guests who might arrive, and owner Cecilia Price-Knight hosts and oversees all. Most servers give their names before reciting, "I'll be taking care of you tonight," but rarely do the introductions go both ways; at Impressionz, Cecilia not only introduced herself but also asked all of us our names, including our children. Her warmth was palpable, and conversation began to flow, pausing only when she returned to the kitchen. 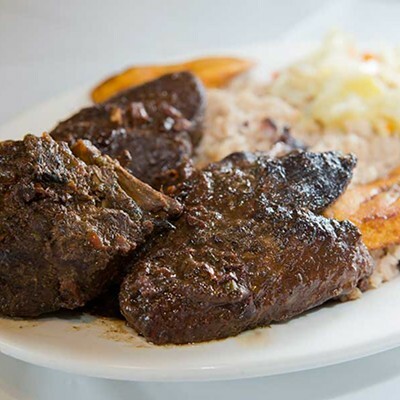 Impressionz's menu is split between a limited selection of Jamaican specialties, including jerk chicken and a few stews and curries, that are made in advance, and a much longer, more varied list of items "made to order," which take a little more time to arrive. To take full advantage of the latter, plan to arrive on the early side: Impressionz closes at 8 on weeknights. 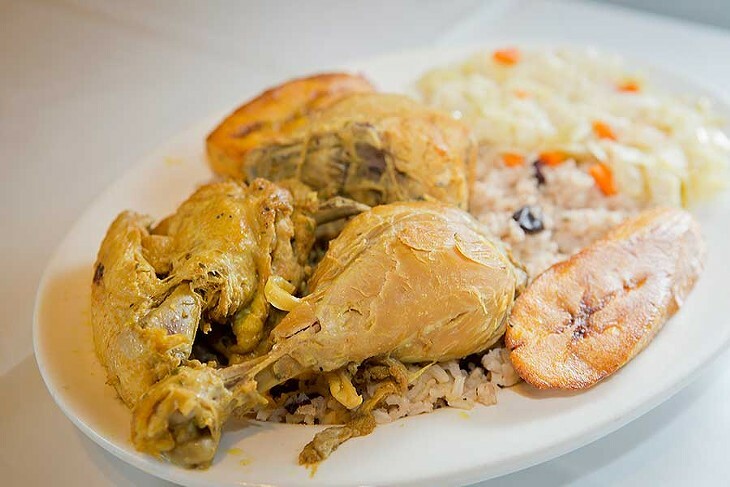 Jamaican cuisine is a melting pot, reflecting Caribbean, African, European and Asian influences, and all of it was on display at Impressionz. 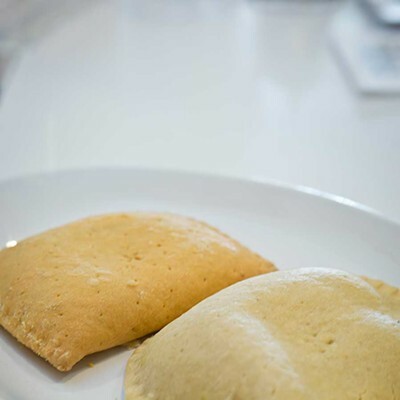 As you might expect from an island, many of the dishes revolve around seafood. 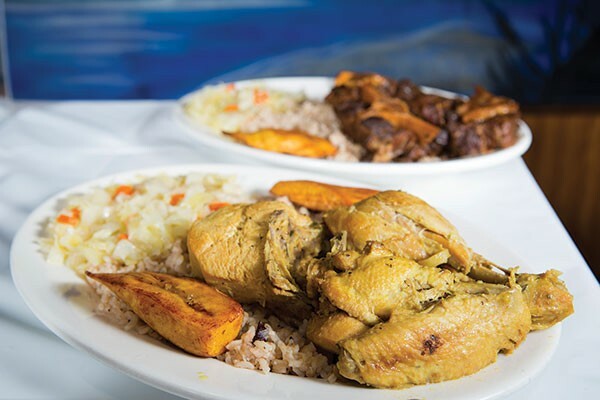 Not only the famous chicken, but also fish and shrimp can be had jerk-style, as well as in several other preparations: steamed, curried, salted and more. We tried tilapia escoveitch, a Jamaican variation of Latin American escabeche, in which fish is marinated in an acidic sauce with onions, carrots, peppers and spices. The pair of deeply browned filets was very vinegary indeed, but a bed of rice was a good foil. Somewhat gummy, it became loosened and brightened by the vinegar. Goat curry had a golden sauce like a turmeric-based Indian curry, but a different spice blend: less hot chili, more allspice and mustard. 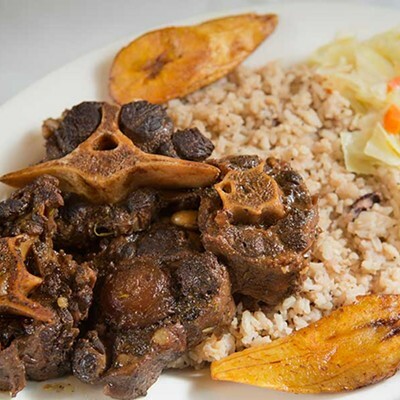 Americans don't eat much goat, possibly because of all the bones, but Impressionz's goat was so meltingly tender, and so savorily flavorful, that the bones were a small price to pay. In this dish, we wouldn't trade it for any other meat. Also tender and extraordinarily flavorful was oxtail, presumably the form of beef most available in a poorer nation, but transformed here into a stew rich enough for a king. Simmered in a deep-brown sauce that was lightly spiced to let the beef flavor come forward, it required almost no fork-and-knife work to separate the meat from its bones. One can hardly dine at a Jamaican restaurant without sampling its jerk chicken, rubbed and marinated in herbs, spices, sugar and chilies. Impressionz served one piece of dark meat and one of white: Both were tender and juicy within their mahogany jerk coating. The heat of the peppers came on strong at first, then receded to a manageable level. Plantains as well as rice helped counterbalance the spice. The chicken was dry, however, in a stir-fry which was otherwise an interesting interpretation of a generic Chinese dish. Its thin, slightly sweet soy-based sauce was more satisfying than typical takeout Chinese-American, perhaps thanks to surprising bits of thyme. Chicken and beef patties were unremarkable, tasty enough but neither fiery within nor especially crispy without. But we'll return to Impressionz for the unique seafood preparations, the luscious meat stews and the wonderful warmth of the Price-Knight family.